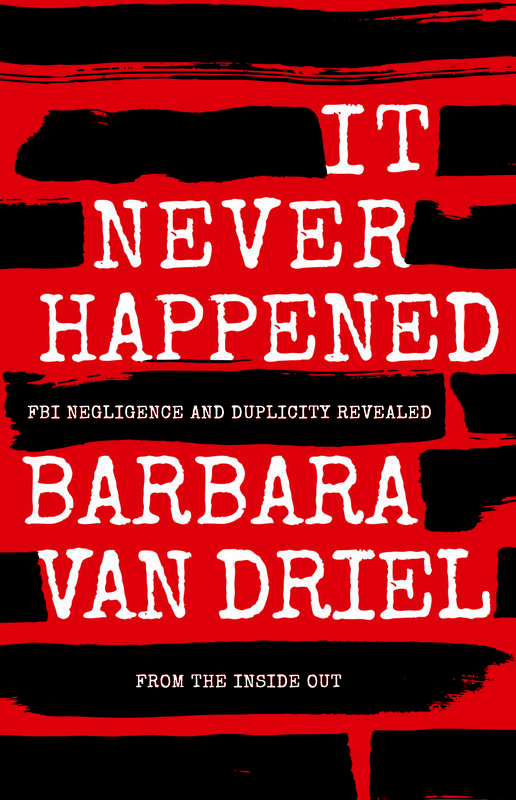 It Never Happened: FBI Negligence and Duplicity Revealed from the Inside Out chronicles Barbara Van Driel’s eight-year career as a Special Agent in the FBI, exposing the dysfunctional culture of one of the country's most formidable bureaucracies. With honesty and self-deprecating humor, Van Driel not only paints a searing picture of what it was like to work sensitive cases surrounded by senior agents who had lost their enthusiasm to serve their country and its citizens, but she describes a maddening culture of apathy that rendered the workplace a hostile environment. Diligence and integrity were rewarded with discouragement, resentment, and sexual aggression. Van Driel recounts multiple incidents of shocking sexual predatory behavior that were met with indifference by the established order, exposing an entrenched ethos of conformity and silence in the face of injustice and abuse. After many years of contemplation, I wrote It Never Happened: FBI Negligence and Duplicity Revealed from the Inside Out in order to reveal how the Bureau functioned during the early years of the assimilation of women and minorities into the FBI. While in the agency, I was a target of significant sexual predatory behavior and was prevented from properly redressing these abuses. Additionally, I wanted to expose the indolence and negligence of senior agents who worked, at that time, in counterintelligence. My hope is that this honest and penetrating account will inspire others to always adhere to a personal ethic of truth, dignity, and integrity. Q: Briefly describe your memoir in your own words. BVD: It Never Happened: FBI Negligence and Duplicity Revealed from the Inside Out is the story of a young and idealistic woman who embarks on a tremendous journey of discovery, good and bad. Told through short vignettes, my memoir attempts to capture the feel, the temper, of what it was like to be a female Special Agent in the 1980s. Q: What caused you to decide to write your memoir at this time? BVD: Actually, I decided to write my memoir a number of years ago after watching the film Breach (2007), which depicts the last several months of the FBI career of notorious spy Robert Hanssen. Because I worked on Hanssen’s squad following my Russian language education in the mid-80s, I was particularly motivated to bring to light certain aspects of his personality and behavior that were not captured in the film. Q: What was the hardest aspect of writing? BVD: The hardest aspect of writing my memoir was trying to explain things I know very well to an audience whose impression of the Bureau would make these things seem almost counterintuitive. For example, my description of “banging the book,” the ridiculous practice of misrepresenting one’s actual time worked: who would expect highly trained and “ethical” federal agents to deliberately and daily cheat their fellow citizens? And more to the point, who would expect those same agents to ridicule and pressure a person who is not willing to cheat on her time? Fleshing out what that culture was like was very difficult.